The Boone County Sheriff’s Office has been protecting and serving the citizens of Boone County for well over 100 years. In addition to providing primary law enforcement in the unincorporated areas of the county twenty-four hours a day, seven days a week, the Sheriff is also in charge of collecting taxes. Boone County is mostly rural and consists of approximately 503 square miles with over 24,000 citizens. Law enforcement and answering 911 calls is a huge part of what deputies in Boone County are tasked with, however, there are many other duties they have as well. 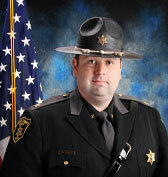 In addition to answering approximately 7,000 calls for service annually, law enforcement Deputy Sheriffs are also responsible for keeping the courts safe, handling mental hygiene orders and transports, serving all civil process from the court system and many other details which allow the county to function safely and smoothly. A BETTER PLACE TO LIVE"
The Sheriff’s Tax office in Boone County is responsible for collecting all personal and real estate taxes in the county. Deputies working in the tax office collected over $34 million in the most recent fiscal year. They also collect monies for Concealed Weapons Permits in the office located inside the Courthouse. We hope you enjoy a look into our day-to-day operations and find this website insightful and useful. We strongly believe an informed public can work hand-in-hand with law enforcement to be a safer public. Using this website as a tool, we hope to work with the citizens of our great county to keep them better informed and provide a safer place to live. The Boone County Sheriff’s Office shall be known as a professional organization responsible for protecting and serving the citizens of Boone County while holding true to its core values of Integrity, Honesty, Dedication and Professionalism.